When you travel to Italy you can be rest assured that accommodations will not be a problem. Remember that this is one of the biggest tourist destinations of the world so there is a healthy helping of hotels, villas, inns, and bed and breakfasts to choose from. You may be on a budget, you may want to live in luxury, you may want to experience Italy in the home of an Italian or you may be traveling in a group and prefer to stay at a place that can accommodate everyone. All the largest international hotels chains have a place in Italy so if that is what you prefer then there will be plenty of choices for that especially in Rome. During your vacation to Italy you will find that there is something to suit everyone’s needs. However to completely experience Italy on your vacation it is recommended that you stay at a small bed and breakfast if you can. 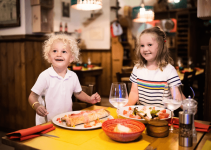 Most of these are family run and you will hear all kinds of stories, folklore and little known facts that may not be in any of the guide books you may have with you on your Italy vacation. Some of the bed and breakfasts will even offer you a price to include a roundtrip ticket from London. If you are traveling in style and you are visiting Venice, you may want to consider staying at the Novecento Boutique Hotel. It is a chic bed and breakfast that is family run and offers luxurious accommodations. 30 minutes from the airport and offering free internet services, this hotel is modern but still maintains the old Venetian feel to it that will be appreciated by even the most discerning visitors. It is very close to many of Venice’s main attractions and with only 9 rooms, it is most suited to smaller groups or pairs. Most of the rooms have antiques collected by the owners through their own world travels and the bathrooms are especially large. The food here is said to be excellent and this boutique hotel is noted for its peaceful setting even for being as close as it is to all the action in Venice. This is the perfect place to stay if you are in Venice for your Italy vacation. If you are visiting Florence, you should consider staying at a place called The Artist’s Residence. Florence is the seat of Italy’s artistic soul and this bed and breakfast is the perfect place to experience the renaissance. It is in the middle of old Florence and is furnished with 19th century sculptures created by Giovanni Dupre. The present owners of the bed and breakfast are his descendants. You will find original florentino tiled floors and even the bar counter was a confessional from 1500AD. Some bedrooms have terraces and you may be able to see the courtyard gardens from your terrace. Breakfast here is also said to be excellent and there are numerous restaurants close by to choose from for your other meals. There are 45 air-conditioned rooms here and also a gym and a solarium. This hotel also provides access to the internet if you cannot go without it on your Italy vacation.